Medrith Nuttle is a contemporary American Impressionist painter. She works in acrylics on stretched canvas, which may look like oil paintings. She paints both en plein air and in her studio. Her subject matter ranges from landscapes and seascapes to still life. 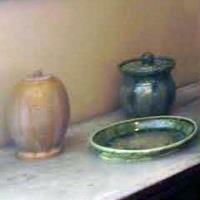 Frank Grubbs is a self-taught potter. 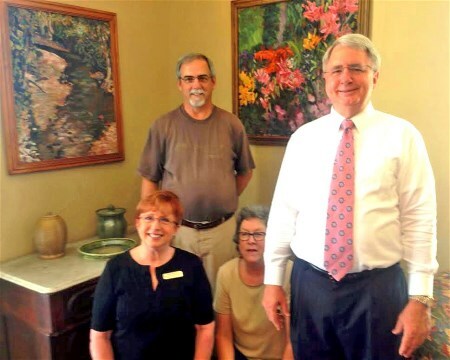 Frank has taught ceramics at Mount Olive Junior College, at Lenoir Community College, and through the Arts Council of Lenoir County. His pottery can be seen on his Facebook page, or by visiting his studio and home gallery in Smithfield. If you are interested in seeing or purchasing any of these works, you may stop by the Chamber office during normal business hours. All proceeds go to the artist.